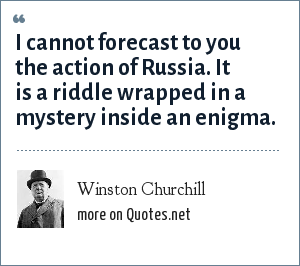 Winston Churchill: I cannot forecast to you the action of Russia. It is a riddle wrapped in a mystery inside an enigma. "Winston Churchill Quotes." Quotes.net. STANDS4 LLC, 2019. Web. 18 Apr. 2019. <https://www.quotes.net/quote/11929>.